Last week was not a fun week, so I unplugged this weekend. It was fabulous!! Not so fabulous for Lloyd, since at the time of this writing he has spent 24 waking hours of his weekend in this computer lab, and he’s not done yet. The movies I watched came from a Red Box, the vending-machine things. I had never used one, and was too embarrassed to take a picture while using one, so no photo. I learned that if you want to get a new release like The Proposal, you have to reserve it online first and then pick it up at the machine. Otherwise you stand there shivering outside the Walgreen’s for fifteen minutes going through screen after screen of choices, muttering under your breath like an insane person. I feel like I am in science fiction land. 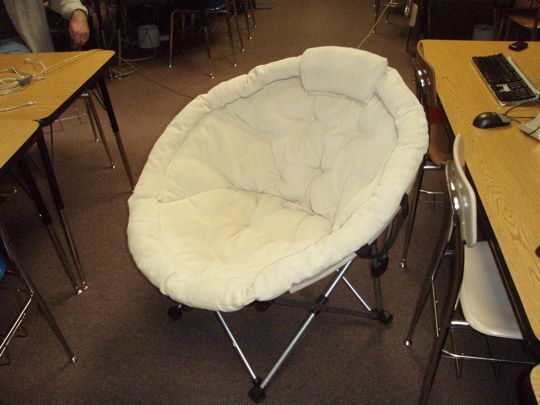 Folding papasan? Red-box? Walgreens? Wha? I think the “muttering under your breath like an insane person” part is probably optional, since you sort of do that all the time. If you weren’t singing the Menard’s song, I don’t think you would appear too insane. Yea, how about a review? Movie 1: Last Chance Harvey. I wasn’t that impressed. It had some very awkward moments, but at least it had Emma Thompson in it, and she was older and beautiful, and she wore boots. *sigh* I love boots. Movie 2: He’s just not that into you. I loved it. Total chick flick, and I was sappy at all the right parts. I love your monogram on the cooler!!! You should patent that. That’s actually the logo for Lincoln Lutheran. Heh. I never thought about it working for Lloyd and Lauren. I borrowed it from the school office to keep the Pepsi and sandwich things cool. I hope it’s not normally used for organ transport.